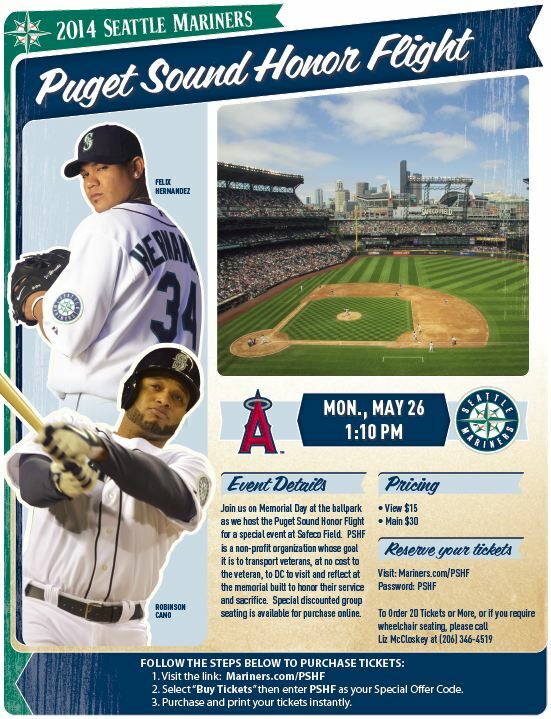 Many of you are attending Memorial Day Ceremonies in your communities, but if time also allows you to attend the Mariners vs Angels ballgame, there is a promotion being offered with Puget Sound Honor Flight. We plan on having about 30 WWII Veterans who have taken an Honor Flight from Seattle on the field for the opening ceremonies and there will be a tribute to our WWII Veterans and Puget Sound Honor Flight on the big screen at Safeco Field. The next Puget Sound Honor Flight Trip to Washington DC will be from May 30 to June 1, 2014.